Those using Grub to multi-boot between operating systems (as per my previous post) should be aware that procedures for changing the boot order is a different process for Ubuntu 9.10 (which now uses Grub2). Users will have to install StartUpManager as per instructions and then selecting the first boot. Other than that, it still works the same as before. Its been on the table for a while, but its finally here. It is now possible for staff to create a sub-site in their programme or module site in Tulip and invite external users. This opens up the doors for collaborative teaching and learning opportunities. In a nutshell, owners create a subsite, activate the sharing feature in the subsite and invite external collaborators using their preferred email address. 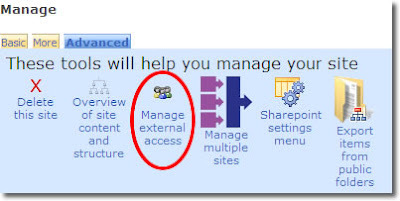 With your new subsite created, go back to the top level (main module or programme page) select Administration > Manage > Advanced (tab) > Manage external access > right click on the subsite you wish to make available and select the options. The usual permissions are available: Owners, Members and Visitors, all of which you can decided who has what. So if you want your invitees to have full control set to Owner, if you want them to read only, then the Visitor option is best. This feature is not available for My Sites.